Like soo many Chinese restaurants in Vancouver, the name 新東記 (Sun Tung Kee) was transplanted from a hot pot restaurant of the same name in 尖沙咀 (Tsim Sha Tsui), Hong Kong. For most of these “transplanted” restaurants, the same name is supposed to evoke some sense of home and supposed-authenticity; there is of course rarely ever any relationship between the two restaurants. Anyhoo. I don’t mind this place. Note this is not the other place down the street people call Sabo. The service here is quite attentive, the restaurant is spacious, and the portions aren’t bad. The fish fillet slices… I think it’s cod. I can’t be sure. It was pretty good though. 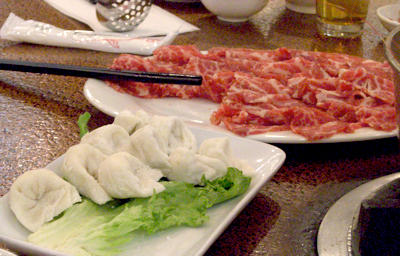 Hot pot is not complete with fatty beef, right? They always order the fatty beef. Those dumplings have fish in them, I think. Killing some shrimp in the fruit and veggie soup, and there’s some cod head on the bottom right there. As a default we also order that mushroom chicken rice that comes in the stone pot. It’s pretty good. I forgot to take a picture of it. Oh well. There’s always complimentary plum juice and tong shui dessert (this time it was red bean soup) afterwards. 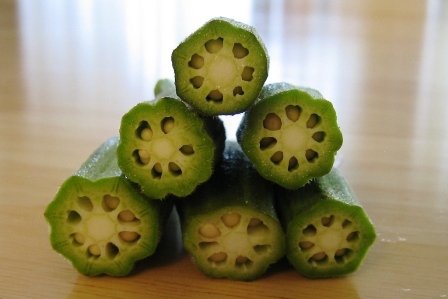 The inspiration for this dish came actually from a batch of beautiful fresh okra, and a curiosity about cooking with tea. 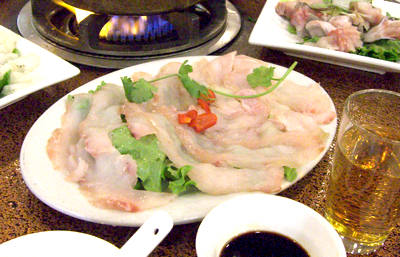 I’ve always wanted to try the various ways you can use tea to cook fish (poaching, crusting, smoking). So my first attempt was to marinate halibut with green tea. The marinade also had a bit of miso, wine, and fresh ginger. 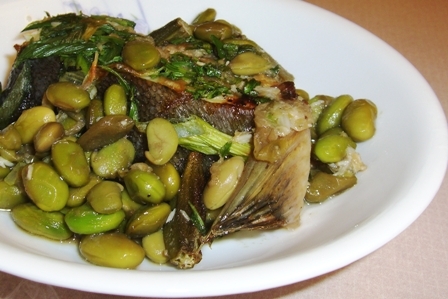 The fish was then baked, along with edamame beans and whole okra pods. I liked it (and I didn’t expect you can just bake edamame straight and have it kinda crunchy like that and still edible without pre-cooking it first). The tea wasn’t as strong as I thought it would be, there is only a slight hint of it, so next time I will try some stronger stuff- maybe that expensive container of Dragon Well black tea. La Patisserie is my favorite Asian pastry shop. Many Chinese bakeries are known for both traditional Asian goodies (egg tarts, lotus-seed buns, moon cakes), as well as Western-style desserts (mostly of French influence, a lot of cheese cakes, mousses). La Patisserie is one such shop, and makes everything to such excellence. For years they were a small place in a Richmond strip mall, and I remember getting pastries and their sweet, soft loafs of white bread many a times with my mother. They also make my favorite cake here – fresh mango cake: a sponge cake filled with a thick layer of chopped mango and cream inside, and large slices of mango draping the entire outside. The sweetness of the cake comes mainly from the mango, which is really fresh. The cream is not overly sweet or thick at all, and the sponge cake itself is very light and fluffy. So it doesn’t feel like you’re eating a super dense, sweet cake, which I have never liked. Often when I go I buy these wedges of cakes, a sampler box of sorts … Here I got a mango one, but not a fresh mango, therefore not my fave, but still good. Another which I believe is some kind of coffee flavored tiramisu. And a green tea one. Anyway, few years ago they expanded into Vancouver, so there is another store on Granville and 66th. Give it a try, and definitely try the fresh mango cake if they have any. I’ve never been disappointed. It’s Spring! That means Spring cleaning! So I’ve been spending many a weekend (including the four days of Easter long weekend :-P) painting the house, throwing out a lot of old junk, getting some new furniture, and rearrranging things. These are little cabbage boats I put together for a quick lunch during painting. Basically I had in my fridge half a head of napa cabbage, half a carrot, some green onions, and left over rotisserie chicken (because I anticipated I would need that chicken). Cabbage rolls would have involved actual cooking, and I was too famished for that. I could have just ripped the cabbage up and thrown together a simple bowl of chicken salad, but hey, this is just as simple and a lot more fun. The Napa was crunchy and the chicken and hot sauce tastey. You’d definitely need to use your hands to eat this, but the boats held together nicely and it was not as messy as I anticipated. – Srirarcha and/or soy sauce, to taste. 1. Wash cabbage and reserve 6 large pieces that can serve as “boats”. Cut the rest up into strips. 2. Mix cabbage with carrots, onions, and chicken, and 1/2T Sriracha sauce, some soy sauce (more or less depending on desired spiciness). If you want, you could also first cook the cabbage until it is soft – this will hold the filling together better but will make it less crunchy. 3. Stuff boats with the cabbage mixture and serve. 蛋散 – which roughly translates into “egg shatters” – is a Cantonese dim sum dessert. It is made from a dough of eggs, flour, sugar, and lard (hmm!). The dough is rolled out flat, cut into strips, then twisted and deep fried. Malt syrup (or sometimes honey) is drizzled over the cooled finished product, which is sometimes also sprinkled with coconut flakes. Freshly made 蛋散 smells wonderful. When made well, it is light, slightly crunchy yet soft, sweet but with a very distinct and wonderful taste of the eggs which balances out the sweetness. But making good 蛋散 is an art – most places don’t make it well and it turns out soggy and heavy, or the dough is too thick, or it is often too sweet, either because too much syrup was drizzled on it, or the dough itself contain too much sugar, both of which I find overpowers the nice egginess of 蛋散. We had these for dessert when we came to Kirin Seafood Restaurant (@ City Square) for C’s farewell lunch earlier this week. This is one of my absolute favorite places for dim sum, although I must admit that I find the Richmond Kirin to be slightly better. Maybe I am just biased, but then I also think it is not easy to satisfy the picky palates of Richmonders. As usual, much quality dim sum was ordered and enjoyed, though (unfortunately) we didn’t order any internal organs, tripe, or feet (lest we scare H, who had never had dim sum before). Plus there was even enough dishes to keep all the vegetarians happy and stuffed! And – because for some reason it’s the typical rule for sharing food – there is always one of each thing left on the plate. OK, so they might not be the prettiest looking sea creatures around, even if you weren’t gonna eat them. But Cucumaria echinata, the common sea cucumber, are believed to have immense healing properties, and even aphrodisiac powers (just look at that … er, beautiful … shape). And according to Sinden’s group at ICL, who recently published their study in PLoS Pathogens, the sea cucumber produces a lectin that may even block malaria transmission. (And no, I didn’t just present a journal club on it ;-D.) The Chinese call sea cucumbers “海參“, which literally translates into “sea ginseng”. It is often sold in a dehydrated form. The Japanese take the intestines of sea cucumbers and ferment them into a delicacy known as konowata. Whether or not you believe in its nutritional benefits, it can’t possibly be bad for you, being mostly protein and virtually fat free. Now, whether you want to eat it is a different story. Sea cucumbers have a gelatinous, chewy, rubbery texture. It is not so much slimey as it is slippery. Whatever you call it – I guess it’s not the kind of mouthfeel for everyone. I happen to like gelatinous, slimey foods (thus my love for uni, jelly fish, tapioca pearls, okra… just to name a few). It’s a combination of personal taste and what you grew up with. I was never the kind of child who shunned foods, neither were my parents. Growing up at the Chinese dining table, I ate everything from pork intestines to chicken hearts to fish eyes to… maybe I’ll stop here. Anyway, a sea cucumber? Bwah! That’s nothing! 1. First brown some garlic cloves, fresh ginger slices, and green onions in a bit of oil. 2. Once those cook for a bit, add a bit of chicken broth and about 2T of oyster sauce or abalone sauce, and some shitake mushrooms. You could also add some shredded barbeque pork here, the flavor goes well with sea cucumbers, but this is not necessary. 4. Wait for that to cook for a minute or two, and put in the whole sea cucumber (you can also first cut them into slices if you like). 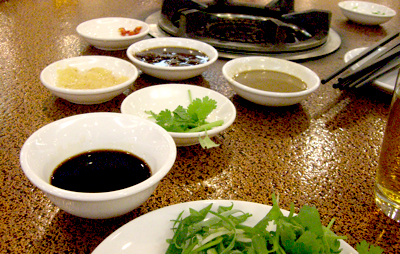 The sea cucumber should sit in the braising liquid but not be totally immersed in it.